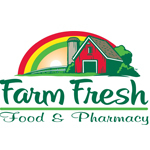 Farm Fresh Food & Pharmacy has been setup in the year 1957 as a neighborhood grocery store. It got its name with entries being made by local people. It merged with its competitor Giant Open Air Markets in 1986 and it is a supermarket series setup in Virginia with 43 stores. The company is headquartered in Virgina and has largest presence in nearby area of Virginia Beach. It is entirely owned supplemental of Eden Prairie (Minnesota based SuperValu). On 15 September 2012, Bill Parker (senior Vice President of merchandising) of the firm took it over as President of the company.